I don’t know if there are many other cities where there are so many people selling flowers, and flowers are so easily and cheaply available everywhere. These kinds of flower vendors can be seen everywhere. Sometimes they sell “just” flowers, but many times they also sell these flower garlands. 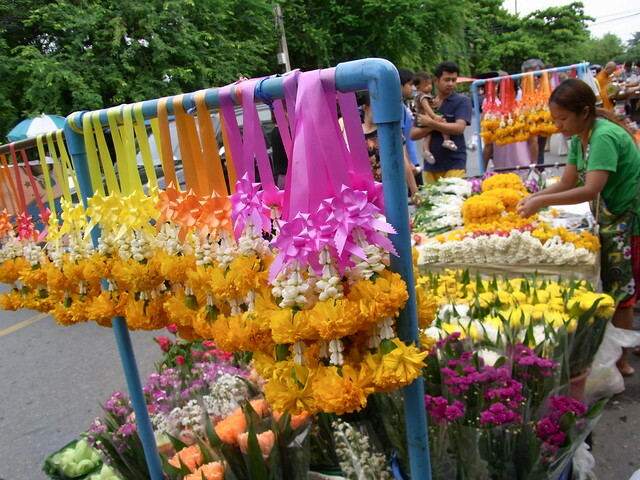 Below an article from a guest author about floral traditions around the world, which also talks about Thailand. A few years ago, I was the only “gweilo” (Caucasian) in my Chinese friend’s wedding party. Even more interestingly, I was the maid of honor. Although the ceremony was quite Christian, there was one interesting Chinese influence. None of the flowers, especially those being carried by the wedding party, could be white. In China, white flowers are commonly associated with death, making the vastly inappropriate for use in a wedding. As a result, we all carried bouquets of red roses, the color traditionally associated with luck and happiness. The entire experience opened my eyes to the fascinating variety of floral wedding traditions in different cultures. Flowers are so beautiful that it is not surprising that they are used in weddings all over the world. What are fascinating are the uses to which they are put. In Thailand, for example, the mothers of the bride and groom drape a “puang malai” (flower garland) around the couple. While the couple sits, facing each other with their hands pressed together beneath their chins, the garland links their hands, ensuring them good fortune in their life together. In a Greek Orthodox wedding, crowns of orange blossoms are traditionally worn by both the bride and the groom. A ribbon joins the two crowns, symbolizing the couple’s unity. The blossoms symbolize virginity and purity because they are white and fragile, and they emit a sweet, delicate scent. The flowers are also long-lasting, an advantage during the rather lengthy orthodox ceremony. In England in the Victorian Era, there was an obsession with the symbolisms of flowers and flower colors. It was during this era that the nosegay was popularized, a form of bridal bouquet still trendy today. Roses were the standard, although the different colors represented different ideas; red was for passionate love, peach was for modesty, white was for purity, etc. Also popular were daisies (innocence) orchids (true love), chrysanthemums (wealth and abundance) and freesia (innocence). Orange blossoms were also very common, representing the same ideals of purity and chastity as in a Greek Orthodox wedding. A great number of the floral traditions and associations of the Victorian Era are still present in Western society today. The idea of needing to attract good luck is also a common theme in international floral wedding traditions. In some European countries, such as Sweden and Denmark, grooms carry small packets of strong-smelling herbs in their clothes, including garlic, chives and rosemary. Such herbs are thought to bring good luck. This is similar to the ancient Roman tradition, wherein brides carried bunches of herbs to scare off evil spirits. In England in Victorian times, the bride tossed her bouquet to her best friend at the end of the ceremony, which was thought to keep that friend safe, protect her from evil and ensure that she would be the next to marry. This tradition has evolved into the bouquet toss of modern weddings. And in India, the groom’s brother sprinkles flower petals over the couple at the end of the ceremony, again to protect the pair from evil. Victor Epand is an expert consultant for flowers and gifts. When shopping for flowers and gifts, we recommend you shop only at these sites that specialize in weddings, love, romance, wedding flowers, gift baskets, flowering.